Ambassador Guido Biessen took up his duties as Permanent Representative of the Netherlands to the OECD on 1 September 2018. Mr. Biessen was born in 1960 in Heerlen. He holds a Doctorate in Economics from the University of Amsterdam, which he obtained in 1996. Mr. Biessen is a graduate in Economics from Tilburg (1983) and he has a Master’s in Economics, from the University of Amsterdam (1986). Mr. Biessen became an assistant professor at Leiden University in 1991 and was a research fellow at the Polish Academy of Sciences, (1989-1990), and then, at the Foreign Trade Research Institute (1995), in Warsaw. From 1997 to 2002, Mr. Biessen worked at the Ministry of Economic Affairs, first as Deputy Head of Market Analysis and Economic Analysis and then, as Head Strategy. In 2002, he became Deputy Director of Financial Economic Affairs at the Ministry of Social Affairs and Employment, before going back to the Ministry of Economic Affairs in 2004, where he became Director of the Department of Industry and Services. After spending three years (2008-2011) at the Employers Association FME, as Policy Director, Mr. Biessen became in 2012 Deputy Secretary General and Director General Economic Policy at the Ministry of Economic Affairs. 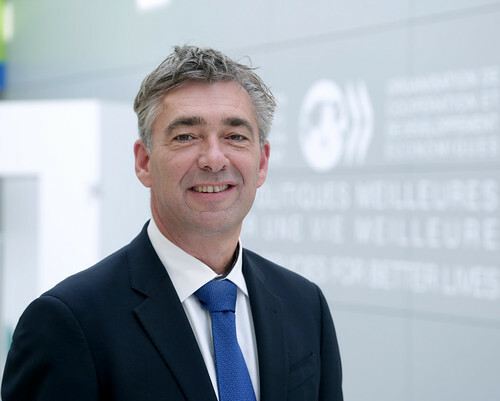 Prior to taking up his duties as Ambassador and Permanent Representative of the Netherlands to the OECD in 2018, Mr. Biessen was the Head of the economic department, Embassy of the Netherlands in Berlin (2016-2018).